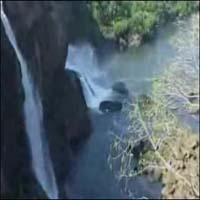 Kunchikal falls is the highest waterfall in India also second highest waterfall in Asia. It was located in shimoga district Of Karnataka state in India. This waterfalls formed by river Varahi. Total height of the falls is 455 meters. It holds 116th place in world ranking (based on height) as per Wikipedia info. Nearby city is Agumbe which was an awesome tourist location for nature lovers. People use to call this location "Cherrapunji Of the South" as it receive very heavy rainfall. Also agumbe has a sunset point, where one can see sun setting over the Arabian Sea, which receives lot of visitors. Few more waterfalls were present near kunchikal were barkana falls, abbi falls, jogigundi, koodlu theera falls.